Boyne Injury Law represents clients in Belleville, Illinois, Southwest Illinois, and the greater St. Louis area. We combine experience with personal service and are committed to helping clients who have been hurt in automobile accidents, at work, or as a result of someone’s negligence, and who, because of their injuries, are having difficulties paying bills, earning a living or getting back to their normal life. 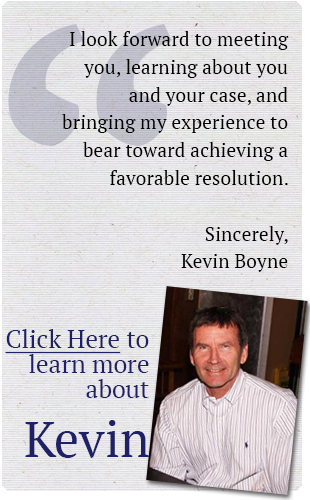 For over 30 years, we at the Boyne Injury Law Firm have represented the injured in all types of accident, worker's compensation and wrongful death cases. We practice in St. Clair County, Madison County, Monroe County, Randolph County, and the surrounding St. Louis Metro East area in both Illinois and Missouri. We understand that you are in an unfamiliar and difficult situation. Let us answer your questions and guide you toward getting your life back on track. We strive to help our clients regain the control they have lost in their lives due to workplace injury, automobile accident or other accidental injuries. The Boyne Injury Law firm serves those in Illinois and Missouri hurt or affected by automobile accidents, work accidents, motorcycle accidents, truck accidents, and wrongful death. 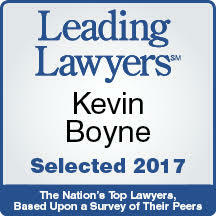 Kevin Boyne is an injury lawyer experienced at representing the injured who might otherwise be intimidated by our complex legal system. He and his team have earned their reputation as a personal injury law firm committed to serving victims and achieving solutions that allow them to resolve their claim, be compensated for their injuries, and move on with their lives. We represent personal injury cases on a contingency basis. There is no fee until we collect. Call to discuss your case with us to determine a course of action with a free initial telephone or office consultation. If you are unable to come to our office call us to schedule a visit in your home, nursing home, the hospital, or other location in Illinois and Missouri. To discuss any aspect of your legal issue in a consultation with a Belleville lawyer, call (618) ­277-­7770 or e­mail us.